What Does Minimally Invasive Spine Surgery Mean? Minimally Invasive Spine Surgery (MIS) is a general term used to describe a variety of surgical techniques which involve making smaller incisions and reducing the amount of tissue damage beneath the skin, thus reducing the amount of blood loss and decreasing the risk of infection. In spinal surgery, a minimally invasive surgery procedure is accomplished with the aid of specially designed instruments which assist in visualization of the surgical field. Typically, this is done with tubular retractors which allow the surgeon to make a small incision while visualizing a larger area beneath the small incision. Newer areas for minimally invasive procedure techniques include the fusion of two vertebrae together and expanding endoscopic procedures (meaning: the surgery is performed through little holes in the skin as opposed to a larger incision). The field of minimally invasive spine surgery is growing rapidly and the overall trend is gearing towards more minimally invasive spinal techniques and new procedures. Spine surgeons who perform minimally invasive spine surgery should be fully trained in the correct use of these techniques. Less pain and decreased blood loss. The potential outcomes of such surgical operations are the reduction of pain and morbidity associated with standard open surgery. At the moment there is insufficient data to show if minimally invasive spinal surgeries provide any short and long term benefit to patients when compared to traditional spine surgery. Is everyone suitable for Minimally Invasive surgery? How should I prepare for a Minimally Invasive surgery? Your doctor will perform a clinical examination and possibly a few tests prior to surgery to see if you are a candidate for the procedure. These may include an MRI, discography, CT scan and X-rays. Tell your surgeon what medications you are taking and ask if you should stop taking them before your operation. To make your recovery easier, prepare your home for life after surgery. Arrange for someone to help you at home after surgery. You’ll most likely be told not to eat or drink the night before the surgery. If you smoke, stop smoking as this slows the ability of bone to grow and repair adequately. What can I typically expect after the procedure is performed? You will normally go through a postoperative care program with instructions to help you recover from the surgery. It is extremely important that you follow the rehabilitation guidelines given to you by your surgeon. What are the risks associated with minimally invasive spine surgery? 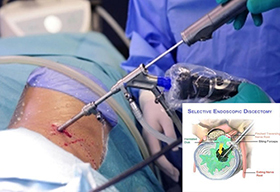 How can I learn more about Minimally Invasive surgery procedures? Your spine surgeon at Spine & Orthopedic Center will be happy to answer any additional questions you may have. Feel free to contact us at 1-888-409-8006 to request more information about or minimally invasive surgery procedures.